FP1010 Single Piece Wet Wipe Machine|forepak machinery Co.,Ltd. 1: SIEMENS Servo control cross-seal system and stacking system, high speed and high performance. Electronic cams parameters easy set and change on HMI. 3:Cutter、in-feed、film feed are controlled by AC motors separately. All machine motors can be controlled individually on HMI. 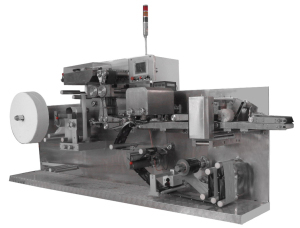 5:With issued Patent packaging material shaping unit, can Easy adjusting width and height. Applying wet wipes width 45mm-80mm. 6:Maximum 300 sets of production parameters can be saved on system database, loading for use for different wipes type production, increase productivity.